Much loved and respected Sydney songsmith, David Lane, heralds his return with a brilliant new album, Head in the Clouds. A stunning collection of sophisticated, melody-driven pop and beautiful, unadorned ballads which have earned Lane quiet recognition as one of Australia’s finest songwriters with comparisons to Bob Dylan, Ron Sexsmith and Paul Kelly. Many of these finely crafted songs were initially recorded in 2007 but remained unfinished. It wasn’t until 2009 with astute direction and final mixing by friend, Amanda Brown (Go-Betweens), did the idea of this album regain momentum. Lane has an undeniable talent for capturing observations in his song writing, carried by infectious melodies and delivered with just the right amount of emotional weight. There is the rollicking, celebratory pop of title track, ‘Head in the Clouds’ and ‘Morning Sun’ or the tender yearning of ‘Mother Earth’. There’s also the hopeful melancholy of ‘(It’s Not) The End of the Road’ or the effortless beauty of the parable ‘Treasure Map’. An accomplished pianist and guitarist, Lane gathers together some of the finest players on this album, including the talents of Amanda Brown (Go-Betweens) on mandolin, keyboards and vocals; Abby Dobson (Leonardo’s Bride) also on vocals with string arrangements by Naomi Radom (CODA); virtuoso, Richard Boxhall on lead guitar and the rhythm section performed by Dean Manning (Leonardo’s Bride), David Galafassi and Pete Farley (Toni Collette & The Finish) with two drum tracks played by Jim Elliott (The Cruel Sea). “A solo record is a bit of a misnomer as many friends have been involved in making this album happen. Of my four albums, this has by far taken the longest to germinate. But I like the fact that it’s been through this progression. The takes are all immediate but the ensuing time enabled the removal of clutter. Like me, it’s very imperfect but hopefully worth a listen or two”, says Lane, in typical humble style. Head in the Clouds is well worth the wait! David Lane is a musician who came to his talent early – he wrote his first song at 10 years of age and taught himself to play piano listening to Billy Joel, Elton John and Neil Young. By the time he was 18, David was playing in piano bars for 4 hours a night, making $160 and not believing his luck. In the 90’s, Lane’s 6-year residency at The Excelsior Hotel in Glebe, saw Sunday nights become an institution on the Sydney music scene with David inviting a colourful cast of musicians, including regular guests Peter Fenton and members of Leonardo’s Bride, amongst others to perform with him. Throughout the 90’s, David recorded and toured with Cleopatra Wong (the band formed post Go-Betweens by Amanda Brown and Lindy Morrison) before he released his first album, Compass (1998) that sold out its initial run. 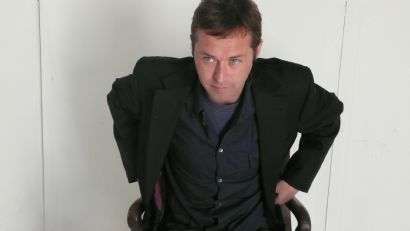 His second album, Put Me in a Taxi (2001), produced by Jackie Orsaczky, featured the Triple J favourite, ‘Goodbye Rollercoaster’. In 2003, David returned from national and international touring with The Church to record his third album, Eleven Reasons to Sing (2003) which also went on to receive excellent critical acclaim. When not penning his own songs, David can be found lending his talent to a number of Sydney line-ups including touring and recording with Toni Collette and The Finish.